Welcome to our recession busting edition of Labelling Secrets! We urge you to take advantage of Kevin Rudd's 30% (Under $2 Million Turnover) or 50% (Over $2 Million Turnover) Investment Allowance and invest in some great label printing equipment that will save you both time and money. Ensure that your orders are placed by June 30 2009 for delivery by 30th June 2009 or 30th June 2010 Financial year to qualify. For official ATO website click here. In this issue we highlight upcoming trade shows, explain the advantages of overprinting variable data in black or colour on pre-printed labels. Now read on for details of our new product releases! Pacprint 2009. Tuesday 26th to Saturday 30th May 2009. Melbourne. Label Power stand V29. Label Power representatives will be on the Label Power Stand (V29) as well the Primera Asia Pacific Stand I57 where the revolutionary Primera CX1200 digital printing press will be launched for the first time in Australasia. Staged every four years, PacPrint is one of the largest and most significant trade exhibitions for the printing and graphic technologies industry in the Southern Hemisphere. The show will bring industry leaders and a myriad of printing technologies together under one roof. If you are involved in the printing or graphics industries or have an interest in conventional or digital printing technology make sure you visit PacPrint. Melbourne Convention Centre, Spencer St, Melbourne City. Auspack 2009. Tuesday 16th to Thursday 19th June 2009. Sydney. Label Power Stand 512. Label Power will be exhibiting the latest in digital printing and labelling technology at Auspack 2009. Auspack 2009 showcases the latest in packaging and processing equipment as well as the latest in Bioplastic packaging materials to help you reduce your carbon footprint. If your business uses packaging or processing equipment then Auspack 2009 is the show to visit. Don't wait another 4 years! Label Power has introduced the new Powerjet Gloss White and Powerjet Clear stocks for the Primera Inkjet and all other roll fed Inkjet printers. We can best describe it as "Glossy Water Resistant Photo Inkjet Synthetic Permanent". Primera USA refer to it as Primera TuffCoat Extreme Label Stock. This revolutionary new stock has a high degree of water resistance that gives photo quality type resolution. It is a full synthetic stock with permanent adhesive. We can convert this stock in Australia to meet any of your sizing and quantity requirements. We now have over 1000 cutting shapes and sizes available. Please contact us for samples of this amazing stock today! If you can not see this .gif please click here. For large inhouse print departments or printing companies Primera’s new CX1200 digital colour label printer is the best solution. The CX1200 delivers short-run, full-colour digital label printing at a breakthrough price. The CX1200 is a digital printing press that prints on self adhesive stocks at high speed. A wide range of digital or conventional label converting options are available from Label Power. Digital full-colour label printing has a wealth of significant benefits. Until now, digital label presses have been an expensive investment in both time and money. The CX1200 means that this is now a simpler, more cost-effective solution. CX1200 utilizes one of the fastest and highest-resolution colour laser engines available. With its incredible 2400 dpi print resolution, the labels you produce will be as good as, or even better than, labels produced on digital presses costing hundreds of thousands of dollars. Colours are bright and vibrant. Text is sharp. Bar codes and graphics are of the highest quality. For precise colour control, ICC colour profiles and Pantone®-approved colour support is included. Additional profiles for various substrates are available. CX1200 opens a whole new world of production and marketing opportunities for your business. Photo-quality, full-colour labels are increasingly in demand. Digital printing is the clear answer to satisfy this growing need while improving your bottom line. See the CX1200 in Action at Pacprint 2009 or at a Label Power showroom. (Label Power Showroom Demonstrations appointment only). Click here to view full specifications page or contact us. Label Power are a quality label and tag manufacturer who are also experts in label application equipment. Not only can we design and print your labels but we can provide solutions that allow you to apply the labels to your products efficiently. Traditionally applying labels accurately to cylindrical containers has required a large capital investment - prohibitive for smaller manufacturers. The recently introduced AP series label applicators have changed this marketspace forever! The Label Power Primera AP-Series Label Applicators are the perfect semi-automatic labeling solution for cylindrical containers as well as many tapered containers, including bottles, cans, jars and tubes even down to 15mm diameter. With an AP-Series Label Applicator you’ll apply labels faster and more accurately – helping to speed up your production. With an AP-Series Label Applicator you’ll be able to apply labels at speeds of up to 1200 per hour. Labels are perfectly applied without wrinkles, giving your finished products a highly professional look. 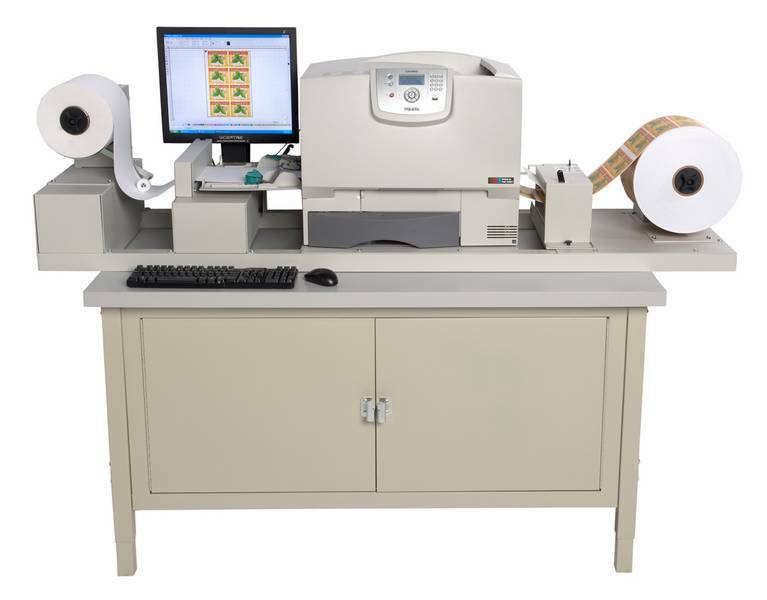 AP-Series LabelApplicators are an ideal accessory toPrimera’s LX or CX-Series label printers. The applicators can also apply roll-fed, pressure-sensitive labels produced by most other flexographic, offset and digital presses. AP360 - This is the base model. Quickly and efficiently applies single labels. AP362 - This is the advanced model. It can apply one or two different labels to a single container. A built in LED counter and memory for up to nine front and back label offsets is also a feature.